Profoundly unlucky and saddled with an inferiority complex, Breakdown's all consuming paranoia runs so rampant that it often distracts him and causes accidents, becoming a self-fulfilling prophecy. He takes out his frustrations on others to cover for his own insecurities. His bow fires sonic disruptor arrows that scramble mechanical circuits. 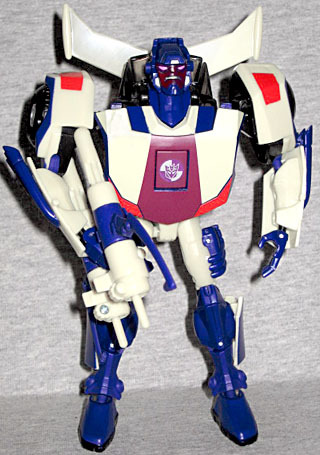 Breakdown was the second BotCon exclusive revealed, confirming that we were getting a whole set of Stunticons. He shares his mold with Rodimus Minor, which means that the mold is still beyond the reach of most collectors - first it was a Toys Я Us exclusive, now BotCon. Poor guy can't catch a break. Breakdown has always been a paranoid wreck who believes that the universe is out to get him, but somebody somewhere must like him, because this is the fourth time he's been a BotCon exclusive. The three previous have all been in "Generation 2" colors, though, so this is the first time he hasn't looked like a reject from Miami Vice. His body is mostly a creamy white, with a burgundy patch on his chest and a lot of dark blue. The construction of this one shows evidence of it being a limited run for a small company: rather than everything working smoothly, the shoulders have been mis-lubricated; one's too dry, so it's hard to turn; and the other's too oily, so it pulls off the balljoint too easily. It's not a major problem with the toy, just a minor annoyance, but one worth noting. One of the twin missile launchers in his bow is very tight, as well, so the arrow doesn't actually spring out. Breakdown is one of the figures in the set to get a new head. Trent Troop and Greg Sepelak did something like 250 different designs for the set before bringing them to Derrick Wyatt for approval, but this one is very nice. He appears to be wearing a "helmet" with a bit of a brim over the eyes and pods over the ears. Oh, and he's frowning. Jack Angel was scheduled to voice Breakdown at the script reading, but he got sick and couldn't make the con. 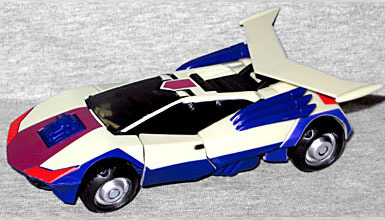 (He'd voiced G1 Breakdown in his first appearance, though it later switched to someone else.) So rather than leave the part empty, they got a Transfan called Vangelus to sit in. This entry was posted in blog exclusive review, BotCon, Hasbro and tagged BotCon 2011, Transformers. Bookmark the permalink.